A lightweight and impact resistant fin, using a bi-polymer high performance material, that will withstand impacts at low temperatures. An ergonomic foot pocket is comfortable and features a non-slip system on the sole of the fin. The new bungee style sling strap with finger holds aids donning the Seac F1S even with gloves on. 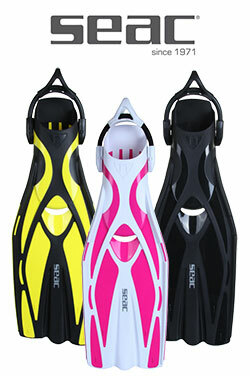 To ensure a longer life the fin blade has protector ribs located on the top, to help resist abrasions.